The Kenyan trio of Eunice Sum, Janeth Jepkosgei and Agatha Jeruto on Thursday swept the medal podium with a 1-2-3 finish in the women’s 800m finals at the Africa Athletics Championships in Marrakech Morocco. 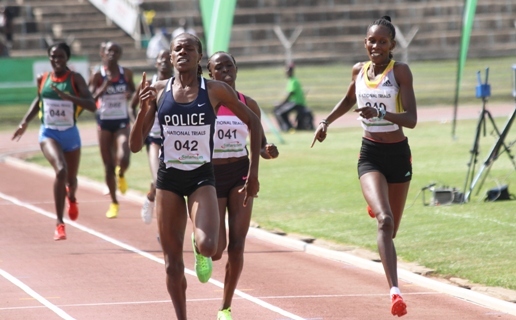 The three were in superb form commanding the pace of the race from gun to finish with Agatha Jeruto winning her first career medal when she returned third behind her mentors. The impressive Sum was once again the best of the three pulling away in the final stretch to win gold with a time of 1:59.45. Sum’s mentor and training partner Janeth Jepkosgei won silver after timing 1:59.74 while Agatha Jeruto posted 1:59.84 in Bronze position. In the women walking race, it was also a Kenyan dominated field as Grace Wanjiru led a 1-2 sweep. Wanjiru won gold after walking home with 1:37.04.